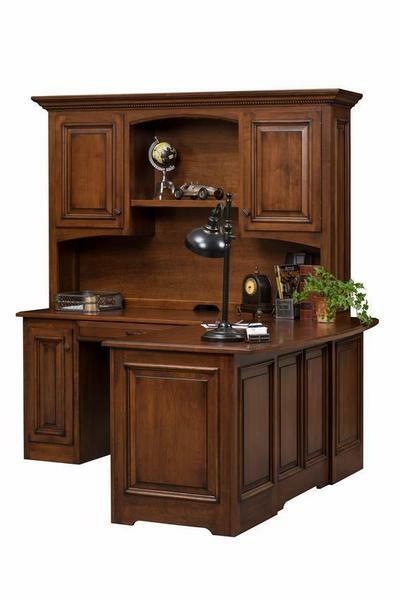 The detailed design of the Amish Liberty Classic Corner Desk with Optional Hutch Top will make a great impression in your home or business office. The design of your desk must support you as you work and the Liberty Classic offers an abundance of function combined with a unique design. Select the wood and stain combination you love for your solid wood office furniture. Consider adding the desk hutch top and enjoy the luxury of additional cabinets and shelf space. Take a look at our helpful blog post, "8 Office Desks That'll Get Your Job Done" for a complete guide to different desk types and their functions. Call an Amish Furniture Specialist today at 866-272-6773 with any questions. Beaded Back- Grooves 1 1/2" Apart, looks like Shiplap back. Note: Hutch Top is Not Standard. You were VERY patient with me and helped me in every step to make sure I wanted a desk & chair that I would be forever attached to......I can’t thank you enough......Great Job!!! !